This entry was posted on Thursday, November 17, 2016 at 5:51 PM	and is filed under @DavidArchie, Appreciation, David Archuleta, fandom, music, The Voice. Tagged: @DavidArchie, David Archuleta, I don't want to feel Numb, James Kinney, new music, numb, Numb Clip Teasers, Numb Lyric Video, Numb Music Video, singer, Tarek Kasmi, The best is yet to come, the Voice, Trent Dabbs. You can follow any responses to this entry through the RSS 2.0 feed. You can leave a response, or trackback from your own site. IT’S HERE! I POSTED IT UP TOP!!!!!! Watched it twice and found myself crying after. Why David has always been my fav musician and role model (told him this in my comment on instagram). He speaks to me. I jumped a little at the black and white shot here dja lol that was very nice!! Agree with Tawna, he DID deliver and it was well done. Very well done Mr. Archuleta!! ♥ I love it! Nearly 8,000 views on YouTube last time i looked! I really like this song and video. So uplifting and positive! Whoever helped David write this song also helped get him out of the slump he was in. Many blessings to whoever was responsible! This song was therapeutic for him and just the medicine he needed to come back to us! Hallelujah!! I just had a random thought about those closeups. Made me think of him like a wounded warrior coming back from the brink to find the light again. The ahem ruggedness gave me that idea probably lol. Thoughts? Your Tuachan recap was superb. written passionately, your trademark. I savored every little morsel. Thank you for taking pictures and video. Loved when David asked what you guys had for lunch. Hearing “soup and salad” wasn’t enough for him. He had to ask what kind of soup y’all had. lol Maybe he was hungry. Bebe, I was over on FB again and the video there showed almost 47,000 views. Yea! It’s picking up fast. Thank you Bebe! David has a huge interest in all things food lol. Over 47,000 views on facebook! Yes looking rugged. I believe he skipped shaving, looks good. That was a nice write up from mj. Hopefully we can gets some comments. I added his songs he message he included with the music video. Nothing I would rather do than wander down a forest path with David. Unless maybe having him show up at lunch. Over the years, David always amazes me, he has never disappointed me. At every stage of his life, we, the fans, always say, is a new beginning for him. Every day in a new beginning for me. David has shown me that the thin layer of ice around him has disappeared. Now the man goes into the water without fear and of his own free will. David has come a long way and I will follow him, as always, as fans. Well he sure kept us holding our breath all day! Thank you David! I watched the vid on my phone first, but when his face filled the phone screen I had to get to my desktop haha. Love the video,all David.Just the way we like it. His expressions are captivating. The beginning…. for a couple of seconds, reminded me of The Prayer video,showing his shoes,then his back,the back of his head , as he and Nathan walked up the stairs remember? Don’t know why that struck me. Loved your recap so much. Tuacahn, just no words…been watching the videos and all of it for a week.Thank you for sharing it all! And the icing on the cake with David singing for you guys at the fan lunch.Good thing y’all HAD just set up the chairs for your group picture,that worked out well to get you off those weak knees when he so casually walked in like he did!! How many times have we wished David would just casually saunter into a fan lunch or gathering??! and it finally really happened! I love the music video for “Numb”! The good news is we get another music video from David next month for “My Little Prayer”. There may not be lots of comments here, but David has over 500 comments on his Instagram post announcing the video – all positive. His concert ticket sales are going well with several sold out and Rexburg has 11,000 tickets (the venue is huge – 15,000 seats). David is back! Hey there Sky, thank you! I say if we can get another St George next year, preferably if September and you and all can try to make it! Grammy J, I love it too! Everything I’ve seen is positive and facebook views are now at 116 views! The youtube views seem to be fewer and I don’t understand why. I love all the commenting all over the place. Twitter has also been busy with the news. Yes dja you have. We get the point. I also shared Numb with my mom last night and she emailed me back this morning saying she loved it and it was nice. After leaving the room for a minute, I guess the autoplay button was on because The Prayer played afterwards. Said it was nice also. Gladys! I hope to see you again! St George wasn’t so cold this time! Yes, we have witnessed this young man grow before our eyes. Gladys we were thinking of you at Tuacahn. It was so nice to have you attend last year. I really appreciate you keeping us in touch with David when he was in Chile. I used to wonder how you could accomplish all that, but I remembered you loved the job. I too miss the boy David. But I still get a glimpse of that youngster occasionally. The smile. The dimples. And there he is. Yay! We are receiving gifts from David almost daily. What a great time for us fans. New music, , a surprise appearance, new video, a Christmas tour upcoming, a half-hour documentary of David being excellent at a Children’s Hospital. He could not think of any weird food pairings, Probably because he thinks it’s all good. Said he could not do impersonations, yet there he was being Martha Stewart giving us a cookie recipe. At Michael’s store I laid down my keychain to go digging for money to pay the bill and the clerk asked, “Is that David Archuleta? I used to just love him, but I haven’t seen him in years. Too bad he disappeared.” How can this be? When I left she was excited to go searching for Numb. I liked the song and video a lot. Sounds like a simple comment but really meaningful. He has an additional style shown in this song and I can’t quite name it! He only has a few more years until he is 30 and that is when Andre Bocelli broke out and everyone could hear him. There will be no pictures from Indianapolis because I will watch every moment like I did when he sang with the MOTABS. You savor his voice and it is just one concert not a raft of them up and down the eastern seaboard. We did what? Yes we did, we went touring and he made it snow. Also, I need a second opinion guys, kind of personal here. So, when the music video for Numb dropped on Thursday I emailed and texted the YouTube link out to my friends. I know it’s only Saturday but for some reason it just made me really mad with the lack of response. My friend Amber (yes I have a friend named Amber in real life that is not his sister) responded the day of haha a fellow David fan as well hope some of you east coasters get to meet her you’d love her and my friend Margaret saw it today. I don’t know why it bothers me this time because I’ve usually been pretty understanding about it all. My friends either are working or still in college so I know that plays a part and is understandable. I guess I was just surprised because of how many years they have been so supportive and understanding and put up with all my ups and downs with being a fan and I always said to them hey if you’re not interested OK it’s fine. I always cared more about people understanding why David means a lot to me opposed to them actually liking his music. I share the things I do as an example of that. Some have grown to like his music though over the years and even like the man himself lol. I’m really starting to doubt my friends including my own best friend!! I’m probably taking it too personally…but any advice? I haven’t gone after anyone being totally harsh because I don’t wanna do that and I know better. Plus, am I being unfair? I don’t know why it bothers me this much because it never did before. Makes me wonder how many friends I even have :(. Add in the probably small number of fan friends because of the kind of person I am…what’s wrong with me? I got so annoyed lately with how people have been reacting too!! Which hey yeah I do fangirl once in a while but I always been more of a serious person (for personal reasons) and I don’t know…I guess I’m just an inadequate fan. I fangirled Thursday with Amber over the phone…I don’t know I’m just having some serious doubts right now thinking oh I’m probably really annoying and maybe people never really cared and I just deluded myself like I did as a kid. (note: I have had my issues as you can see here) Guess it wasn’t fan wise things changed, but even with the friends who stood by me when he was gone and since he got back…guess that’s changing too. Hey Jan, that’s why it hurts. There was never any eye rolling or stuff like that. They were always supportive, found David refreshing, saw how he made me happy, respect more than anything frankly. I need to stop trying to I have always done that more after David entered my life because I just wish people could see there’s better out there and well…sometimes I felt why me for years with his influence in my life because of other people who I’d think would benefit better. I was lucky…I just wish others were too. It’s never been an issue with my Mom she understands (sometimes teases XP like one time when a pic of David was one of my lock screen pics and I got a text she joked is David calling you lol) and has a lot of respect for him. I know she probably wouldn’t want to go to a concert and I’ve always been OK with that. But…my friends always felt more like family to me really and I wanted them with me as a thank you gift to them when I finally see him. Have some fun and relish in the moment I finally meet him and if they want to also get to see them meet him. That’s why when he first left I reached out to fans even though I had people who understood. I felt you guys would have understood more being fans too. But I admit as years went on I felt in some cases I didn’t even have that :(. Here, I always did thus why I always come back. I mean I never cared if they liked David or not I wasn’t offended by that. I just cared more that they saw why he means a lot to me, aka more than some guy I like or famous person etc. But I guess to those in business “doesn’t equate sales” as they say lol. I think I always felt inadequate fan wise or not. It’s just my maturity too. I mean in college some of the younger students would laugh about stuff that I didn’t even think was funny or just…well, just not that good. I’m afraid as it gets closer to Indy I might go hide because that would have been my best shot of seeing this year and that ain’t happening. Also so I don’t hurt anyone just because I have to wait more. That’s what has also stunk with never seeing him; you feel left out when you hear the stories. That’s why with some recaps I don’t comment. I felt so bitter today too. I guess I don’t know what this whole connection with David is now because of the way things turned. 7 Davids are always better than 1! And they went in before the edge pieces. 🙂 Thanks, Abs and @vinniearchie! Gladys, that boy who could not (would not) dance is now giving lessons. You are correct. He is all grown up. I want to tell you about Greg, a fan from originally from the Philipines, he has worked in Abu Dhabi for several years. I met him last year in Idaho, then the Layton concert where David had almost no voice to give. David promised us another concert in Layton, but of course Greg would not be able to attend. I asked him how he felt about that. Greg told me that David coming out on stage and still doing his best was the best gift ever. Greg said the trip to see David had been a dream he had strived to obtain for a long time. A once in a lifetime thing. I spent a few minutes with James the Mormon and found him delightful. He is kind to old ladies. Jan, wasn’t it great to find 7 Davids? i was thinking best puzzle ever, but I think that every Sunday. Good advice for Kristin. Like David says, everything is right. Hello. I’ve been very busy w relatives in town. Thank u DJA for the fabulous post. That Numb video blew me away. So beautiful and an expression of meaning in the sing, not some ridiculous girl/boy story usually in music videos. It was really a work of art in itself. Of course I didn’t mind watching David in his GQ mode either. Dancing lesson from David? What! Where! Lol. He’s a good dancer and tests very sweet of him to teach that young girl. Where do I sign up for dance lessons by David Archuleta? I need to learn how to dance like him! That hospital FB live was awesome even though I couldn’t hear some of his answers when he turned away from the microphone. What did he say was the last thing he bought, I think, at the grocery store or wherever? What was that about oranges (?) and bananas? Plus some other interesting bibs and bobs I really want to know. Also I want to try making those cookies! I wonder if I can skip the cake mix and make my own cake batter. Oh, by the way, love the Numb video. Also love the Seacrest Studio IG video with the Ryan standee. He has perfect comic timing. I say again – he needs to be in a Hollywood rom-com! Dayzee, It amazes me how Gladys, Greg and others travel and go at great lengths to see and hear David. And then the extreme kindness they show to the fans by sharing their adventures with us. I hope they continue and we get to see them again and that David makes it to their neck of the woods someday. SB, so excited that you’re going to be seeing David soon. And yes savor the experience by all means just tell us about if you have chance afterwards :)))) The music video of Numb is getting great praise by all. Everyone I’ve shared it with who aren’t fans are impressed. Hello Oliveoil! David has a very graceful walk, catlike alright. I really believe he will be going east when we least expect it. I have all of the social media because I can’t help myself lol Have a great thanksgiving! Jans, I hope David does more interviews. He is such a natural and we see that David is David. Kristin, I’m going to agree with what others have said. People friends or not will be who they will be. All we can do is be ourselves and do for us. I have no one in my inner circle of friends or family that get me but y’all here do and that’s enough, it has to be. I just accept. I see that Gokey is in that video also. Like to see David living life. Jenny, I agree, it’s a beautiful video. And it doesn’t have to be all about the boy/girl which is fine but love David doing it his way. American Idol posted on their facebook and twitter accounts Billboards article about Numb. David has a great dry wit and is an excellent story teller. Thank heavens he is seldom asked to tell a joke. Yesterday the local paper mentioned David’s gig at BYU and listed Nathan Pacheco as the “opener”. Hmmmm Not sure how that works out. Thanks to Olive for asking opinions on whether David moves like a cat. It gave me an excuse to watch that video some more. Yes, he moves like a cat. A large muscular jungle cat, not that kitty sitting on the couch with a ball of twine. SB, we will not be expecting David pics from you but hope you will tell us how amazing he was. Dayzee, I personally hope that “opener” is just that. Minimal set list with 2 no more than 3 duets. lol the knock knock joke. There was a short piece about David’s visit on the Children’s Miracle Network website!! 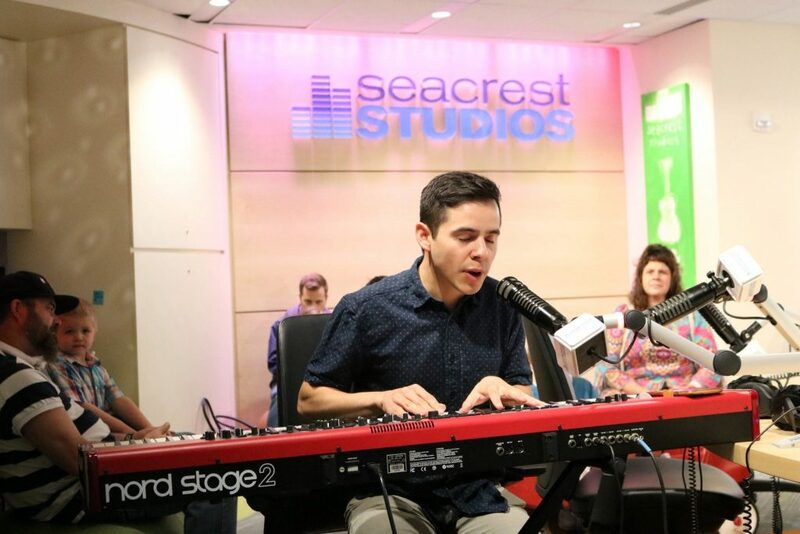 Children’s Miracle Network Hospitals supporter and musician David Archuleta visited pediatric patients at Network hospital Monroe Carell Jr. Children’s Hospital at Vanderbilt last week. Snowangelz made a playlist for repeat viewing! Go watch his IG stories – hilarious! I think scream caps are in order. I don’t know about you guys but to me route rhymes with root, not out. And I don’t have a TV either. IG is the best thing ever invented as far as keeping track of David stuff goes. His posts are turning out to be even better than his vlogs. Here in the USA the pronunciation of route seems to depend on where you live. In the southern states they say it like it rhymes with out. In the northern states it’s like root. This is my personal observation. David now lives more in the south, so he has picked up saying root. My Little Prayer is on Amazon pre-sale. Note the peroid after his name? It’s starting to be a signature. Kristen, I hope ur feeling a little happier now. Its great being a DA fan. I feel like he is a special gift to the chosen few haha !!! I would love to meet you too. Lets pray for an east coast concert . And Djafan, u are right. He walks like a panther. A very sweet, gentle panther, of course :):):) Also, how bout that awesome IG story. Have you noticed how his IG posts are becoming more frequent and longer ? Just like when he talks and rambles at his shows? Looks like good things are awaiting us 🙂 Happy Thanksgiving everyone !! Hi Oliveoil! The instagram story was epic. David looks really comfortable doing these. Hoping for more! Suttygal captured them all and put on youtube! My Little Prayer is out on amazon for preorder! I am just so pleased with all the new David photo’s for his music. The prayer promo picture is gorgeous. Oh and the use of periods I’m not sure of the meaning but I like. Good evening everyone. I was away at my very first writing residency for a week which is why comment wise I was pretty quiet haha. I saw Numb when I was there and it was…well, very emotional, for me. Brought back some personal memories from the last two years with some of my own struggles. Definitely saw things clearly for the first time regarding the song itself…really highlighted those two years for me to a T. Heh, David has always been good at that I guess. I actually watched it twice and found myself crying afterwards when I was gonna send it out to friends. That’s just something David always did; made me feel heard and understood. I want to thank you guys for your insights and encouragement regarding the issue with friends and…I haven’t said a word about it. I don’t think I will. I’m afraid though with my best friend that might be a different story. She was one of the first people who was there and supportive when David was about to leave like he did. So there, it really…hurts a little. I guess now I know what it’s like to be in her shoes because she’s a huge fan of One Direction and…I don’t like them and she really knows I don’t so doesn’t even bring them up around me because of my responses. We’ve had a few arguments with that. David just puts other artists to shame I guess. Dayzee, I have spoken with Greg a few times. Sounds like a nice guy thanks for sharing that story with us!! Oliveoil, yes let us pray indeed!! I do feel a little better though. I think it’s more because David is happy and that’s something I’ve prayed for for years. I thank God every day when I see him smiling and being his giddy self. The instagram stories last night were something else, I also appreciated seeing the cat haha cat lover’s seal of approval. I’ll be OK in time. I internalize things a lot, which is really a bad thing but eventually I come around. Sounds like David doesn’t it? I always joked he was the male version of me lol just from things I’ve noticed. I almost forgot, woo hoo with My Little Prayer. Artwork is AWESOME. Curious to know if there might be a music video for this song as well? Thoughts? I love David’s Instagram stories. His commentary on The Voice was so much fun as I had just watched it, and of course, Violetta is adorable! Just an FYI that FOD had most of the questions and David’s answers for the Live Facebook in a recent post – just go back through their posts until you find it. I couldn’t hear what he said for some of his answers either so I appreciated that they wrote it all out. David was at his quirky best especially when trying to remember the names of the seven dwarfs! El día que David deje de asombrarme, yo no seré mas fans. Y yo creo que eso nunca ocurrirá, por lo tanto yo sere fans de por vida. Es como una ecuación matemática.